Could anything be more adorable than seeing your little Peppa Pig fan play like her favorite cartoon piglet? 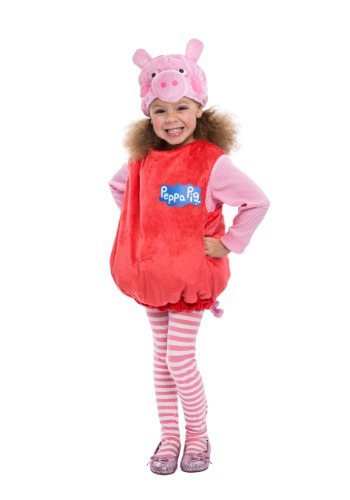 How about if she's dressed up like Peppa as she goes on her imaginary adventures? She'll have a blast in this Peppa Pig Bubble Costume, which looks just like the main character in the popular animated series on Nick Jr! We're sure you've heard all about Peppa Pig, the happy little piglet who's always using her imagination while playing with her friends and family. She loves big adventures, like going to the beach or pretending to be a detective, and also has fun doing smaller things, like helping Mummy and Daddy Pig clean their home, or learning how to garden. Peppa even uses her imagination to find the bright side of things that aren't so much fun, like going to the dentist, or being stuck inside on a rainy day. In fact, she likes rain, since it means there will be plenty of muddy puddles to jump in, which is Peppa's favorite thing! It usually results in little muddy footprints to clean up, but it's still quite an adorable sight. Peppa Pig wears many costumes on her adventures, and when your little one is dressed up in this playful, puffy costume, she'll be ready for some adventures of her own! The dress and head piece are soft and stuffed to help keep their shapes, and will look great with a pink undershirt and tights. There's no telling what activities your little one will dream up, but she'll be dressed for the fun. Though, you may want to keep an eye out for muddy puddles! The costume doesn't now look like the picture. The hat is very floppy and the ears DO NOT stand up! It's also very disappointing that I wasn't able to get the shirt and stocking like shown in the picture. Competitive price. Quick shipping. Costume is very cute and fits to size. My child is 2 but wears a 3T comfortably and this costume fits her perfectly. If she were a 4T I might chose the next available size up. It seems well put together with decent material. It's simple and easy to put on and take off. Our Halloweens tend to be chilly in my area and the costume will do just fine with a sweater or sweatshirt underneath for added warmth. The costume should provide some insulation itself. my only complaint is the hat. It doesn't quite fit her head, which is an average size for her age/weight/height. The cap portion could have been a bit deeper to better secure it on the head. It's definitely going to fall off her head after a few quick head movements. Other than that we are happy with the purchase.